MWF Seeking BFF is solidly in the genre of "do something unusual for a year and then report back on it." After moving to Chicago for her husband, Bertsche decides what she really needs is a new best friend. She was an active sorority girl in college and thrives on being a social butterfly. 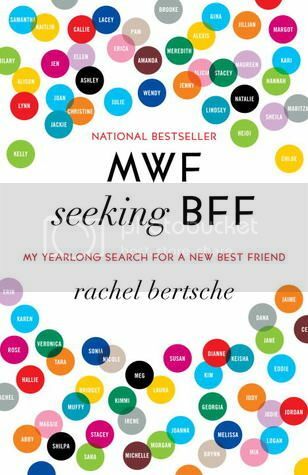 The author has a good sense of humor and comes across as loveably neurotic, at least when she's not being Judgey McJudgerson and ruling out potential acquaintances for being a year or two too old or too young, having children, living too far away, or having some other undesirable characteristic. Fortunately she lightens up as the year goes on. She does, however, randomly interject statistics here and there in her narrative which I thought made her sound a bit stilted. Still, a lot of her advice on friend-making is totally sound. She reminds me a lot of myself when I first moved to Los Angeles, and was determined to "get out there" and meet people. The book is divided into 4 sections: Set-ups and long-lost acquaintances/Taking out a want ad/Clubs, classes and online friending/The Art of the Pickup. Basically, say yes to every invite and force yourself to socialize. Practice doesn't always make perfect, but it does make it way easier when you're widening your friend network. I guess what I found really stunning is that she not only commits to meeting a new person every week, but she also continues to follow up with all her priors that went well. Her final social schedule sounds positively exhausting! A tight-knit group of work friends, two bookclubs, a cooking club, an improv class, family, plus some other randoms picked up along the way. She probably gets out of the house every night of the week. Pair this with The Game: Penetrating the Secret Society of Pick-Up Artists by Neil Strauss for an interesting perspective on how socializing and group dynamics work for 20-something minglers. Bertsche does lean rather heavily on the language of dating for her project. She sets up "girl dates" and "flirts" and bemoans, "Oh. My. God. I just got dumped!" when things don't work out. By the end of the year, she concludes that she hasn't gained a new BFF, rather a "bouquet of friends."